Before heading to my friend’s wedding in Piacenza, south of Milan, I took the opportunity to visit Puglia for 3 days with one of my best friends from Thailand who lives in Finland at the moment. We met up at Brindisi Airport on 18 Sep around 9 pm. After picking up a rental car we drove to our little Trullo, a traditional Apulian dry stone hut with a conical roof in San Vito which is located about 30 minutes from Brindisi airport. I booked this place because I wanted to experience traditional accommodation of Puglia and the location of the Trullo was perfect, right in the middle of the areas that we planned to explore. The host was very welcoming and kind to us. We tried some local fruit from their garden which we very much enjoyed. Our home for 3 nights in Puglia! We left the Trullo around 9 am and our first destination was Ostuni, a historical charming white town with Mediterranean architecture. We walked around The Old Town, enjoyed the architecture and refreshed ourself with drinks at one of the lovely outdoor restaurants. It was an enjoyable morning. The super model from Thailand! After that we headed to Alberobello and before arriving in Alberobello we stopped for lunch at a lovely restaurant with a stunning view in Locorotondo called Controra. The lady was very friendly and served simple dishes, she spoke very little of English but it was not a problem at all. All the way from Ostuni to Alberobello was beautiful countryside a mixture of farms, vineyards and lovely Trullos. It was a good morning drive. After lunch we headed to Alberobello, the town of Trullo. The small town has been made a UNESCO World Heritage site for the district of Trulli, with characteristic white conical roof houses and built with stone. I was amazed and fell in love with this town as it was so cute and so dreamy! We were very much enjoying looking at those Trullos. The town was busy with tourists but it was not too difficult to take nice photos without tourists in it. After hours of walking and shopping we stopped for a drink at a little bar near the parking, with a view overlooking those Trullos. It was very relaxing after a long walk. The reason to visit Puglia was inspired by Anna Dello Russo, an Italian fashion journalist who has a Trullo summer house in Cisternino, Puglia. I follow her on Instagram for fashion but she often posts her beautiful Trullo. Alberobello has to be on your Wishlist when visiting Puglia! After that we headed to our last destination of the day, Polignano a Mare. We arrived there around 5 pm which is a bit late for taking good photos. We walked around for hours and after that we had a seafood dinner and a bottle of local white wine; it was a lovely ending to the day and we very much enjoyed it. We headed back to the Trullo on the highway road on the seaside which took us about an hour to reach home. We planned to visit Lecce before going to the seaside. Unfortunately, we were behind schedule as we woke up late and we also had to pick up my friend’s luggage at the airport so we did not have enough time to see Lecce which I regret. After lunch in Lecce we drove a long the seaside and we stopped a few places included Grotta Della Poesia. It was a beautiful place with crystal clear water. We also stopped at Sant’ Andrea and swam in the Mediterranean for the first time! It was cool but refreshing. We ended our day by having a fantastic dinner (with a few glasses of Prosecco) at Sant’ Andrea with a stunning sunset. We very much enjoyed the seaside even though we did not make it to Otranto as original plan. We planed to visit a few towns but we ended up visiting only one town which was Taranto. We took the last day quite easy as we wanted to return to the Trullo earlier than the first 2 days to enjoy the last evening at the Trullo. My friend prepared dinner and we were talking about our trip and the old days. For dinner we cooked horse meat which we bought in a local supermarket! Our first taste ever of horse meat; quite tender and not strong tasting – similar to beef. But I don’t think I’ll be buying it again. It was a very relaxing and chilling evening with 3 (!!!) bottles of local wine. We very much enjoyed the wine even though we had to run to the airport like zombies at 4 am on the next morning and we even lost 10 Euro in the petrol station automatic machine without getting any petrol because of the 3 bottles of wine! What a fantastic ending! The driver & the photographer! Puglia is very different than other parts of Italy, very rural, authentic, full of history, beautiful and it’s probably the most economical part of Italy for tourism. I found that Puglia was not too busy with tourists compared to other parts of Italy which is one of the things I loved about it. We hardly saw any Asian tourists – we were probably the only 2 Asians in Puglia! The weather was perfect during our stay; it was 25-28c day time and the temperature dropped to 15-18c in the evening which was cool. If you want to travel affordably and love history, architecture, countryside, sea, sun, sand and enjoy drinking wine then you can’t miss out Puglia in summer! After 3 weeks of travelling I finally arrived at my friend’s wedding in Piacenza. It was a traditional catholic ceremony in a church and after that we went for a reception lunch in a very beautiful castle called “Castello Di Paderna”. I also found out that Italian people are very good at dancing and seems they have a lot of energy when it comes to dancing. After the first dance of the couple, everybody joined the dance but I did not have a partner to dance with so, I invited the father of the groom to dance with me, after he spun me 3 times I was sweating! It was a mistake to invite him! He was too good at dancing but I was not. The party ended around 11 pm and it was very enjoyable wedding. It was a good memory with which to end my European trip. I got an invitation to attend my Italian friend’s wedding in Italy in late September, so we decided to take the opportunity to visit Switzerland before going to the wedding. We were in Switzerland for 10 days and we rented a car to get around. 4 Sep 2017 : We landed in Geneva late afternoon and picked up our rental car. We booked an apartment in a village called Villette via Airbnb for 4 nights, located about 10 km from Lausanne and an hour drive from Geneva. The apartment is right in front of Lake Geneva with view overlooking beautiful Lake Geneva and France on the other side! In the back of the apartment is a huge beautiful hillside vineyard. We were very impressed with this stunning location. We booked this place because we always prefer to live like locals; staying in the city or a busy tourist town is not our style. Another benefit of staying away from the city centre is that sometimes you get a better standard of accommodation and good value for money. Swiss people in this area speak French. Stunning view from our window! 5 Sep 2017: On our second day we did a bit of relaxing by visiting Lausanne, where our King Rama IX used to live for 18 years from 1933-1951. We also visited the Royal Thai pavilion. The pavilion was a gift to the City of Lausanne from His Majesty the King of Thailand in 2005 to mark the 60th anniversary of his accession to the throne of H.M. King Bhumibol Adulyadej and the 75th anniversary of diplomatic relations between Thailand and Switzerland. Later in the afternoon we went to Geneva, walked around the city centre and along the waterfront and get the feeling of the rich city. Geneva was busy with tourists, every cafe and restaurant was crowded. We did some shopping and had coffee in a chic cafe before heading back to the apartment. 6 Sep 2017: We left the apartment around 9 am and drove a long the lake to the Chateau de Chillon. A long this road were countless beautiful vineyards and Lake Geneva. We stopped a few times to enjoy the scenery and take photos. On the way back we stopped for lunch at Montreux. We found a good Thai restaurant which is very close to the real deal! We also walked along the waterfront and had coffee and ice-cream at a cute Turkish restaurant. After that we drove back near our apartment and did a vineyard tour by car which was the highlight of the day. We spent a few hours enjoying this amazing area. And to finish a good day we drove up to the top of the mountain and enjoyed a glass of wine at the Restaurant de la Tour de Gourze – friendly service with stunning view. What an awesome day! 7 Sep 2017: We walked up the hillside vineyard in the morning, I could never get enough of those views and the fresh air in the morning made me feel like I gonna live longer! We had a great lunch at the restaurant on the top of the hill called ” Auberge De La Gare” recommend by the host. We had a very nice salad with perch from Lake Geneva and a glass of local white wine with a stunning view overlooking Lake Geneva. The restaurant seems popular with locals. Later in the afternoon we returned to the apartment to catch up with some work emails, take a rest and drink wine for the rest of the day! 8 Sep 2017: We checked out from the apartment at 9 am. Our next destination was the town called “Interlaken” located between Lake Thun and Lake Brienz. After turning off highway No.9 we took road No.11 as we were going to visit the Glacier 3000. Along road No. 11 was beautiful scenery of mountains, villages and lakes. After Glacier 3000 we stopped to have lunch at a quaint village called “Ormont-Dessus”. The village was very quiet, located in the middle of nowhere and looks like it is a winter holiday village for Swiss people. The village was beautiful, each property was well maintained, the whole area was clean and tidy. It was like the beautiful village in a novel which was not real to me! People in this area speak German. After lunch we continue our driving and enjoying the locals lifestyle a long the road and beautiful scenery. We arrived in Interlaken around 4 pm and we booked an apartment in front of Lake Brienz for 4 nights. The apartment is located only 10 minutes from Interlaken downtown. When we arrived at the apartment it was a beautiful sunny afternoon overlooking blue Lake Brienz. After a long day we had such a very relaxing accommodation and we recovered with a glass of wine! It was the most beautiful and relaxing place I have stayed so far. 9 Sep 2017: It was a wet and cold day. We did a bit of driving, went to the supermarket, prepared lunch at the apartment and stayed inside for the rest of the day. 10 Sep 2017: The weather improved today so we could explore more. We left the apartment at 9:30 am and drove around Lake Thun, went up on the hill to a small village called Beatenberg and later we visited downtown Interlaken. The downtown was busy with tourists. Later in the afternoon we went to Grindelwald for the cable car. But first we wanted to experience one of Switzerland’s most famous eating experiences – fondue. So for lunch we found a restaurant that served meat fondue. The other option is a cheese fondue. In fact, there’s also chocolate fondue! Our fondue is a bit like Thai hot pot but instead of water in the heated bowl, there is cooking oil, When the oil is hot enough, you put beef, chicken and pork on the end of long forks and dip the meat in the oil to be cooked. It was served with Thai rice, french fries, dipping sauces and pickles. The cable took 25 minutes up and 25 minutes down. The view was stunning only half way because the weather was not good and unfortunately, I could not take any photos. We returned home around 5 pm. 11 Sep 2017: The weather was much better than the 2 days before, it was sunny with beautiful blue sky so we decided to visit Jungfrau (Top of Europe). We left the apartment around 9 am, and only 20 minutes to drive from the apartment to Lauterbrunnen, a village where we took a train to Jungfrau. We very much enjoyed the scenery a long the railway, many beautiful small villages and hotels are available. It took 1.50 hours to reach the Top Of Europe and when we arrived at the top we went straight away for lunch. There were a few choices to eat and we ate at one of the restaurants which has stunning view over white snow and mountain, that was a good start. After lunch we checked out all the view points and it was spectacular for someone who live in a hot climate all the time like me! Another exciting experience was walking through the Ice Palace. We were 3,454 meters above the sea and this is the highest we have ever been and it was not as cold as I expected. The view at the top was stunning. It’s amazing how nature created this but how humans created the railway 100 years ago through mountains and stone. It took them 16 years to finish Europe’s highest-altitude railway. The sadness is that many lives were lost during the construction. Visiting Jungfrau has to be “must do” on your list when you visit Switzerland. 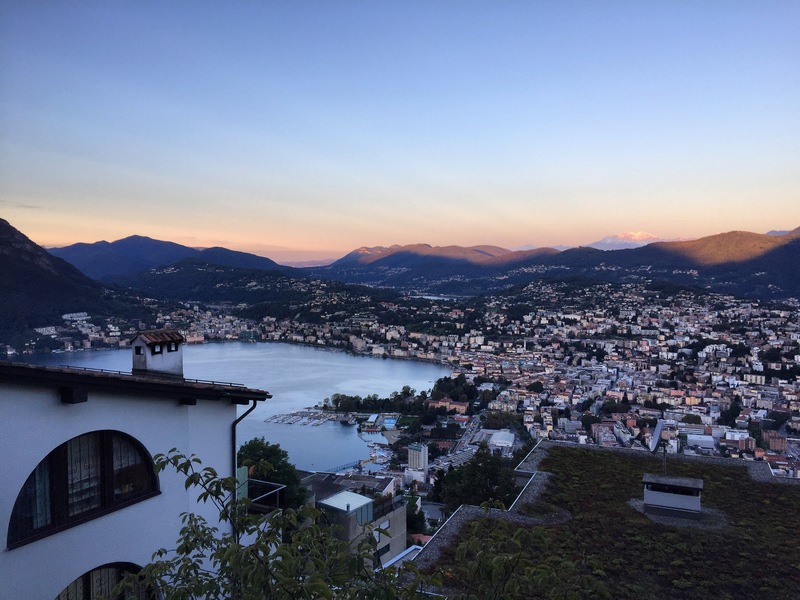 12 Sep 2017: We checked out from the apartment at 9 am and our next destination was Lugano for our last 3 nights in Switzerland. We took the road No. 11 through the mountains and snow when the temperature was zero degree. It was beautiful scenery of mountains with snow and pretty villages. When we reached highway No. 2 and arrived at the Italian speaking area, the temperature was 23 degrees and sunny with a beautiful blue sky. It was like we had just changed countries but we were still in Switzerland. We stopped for lunch at Locarno and checked out the town for a few hours before heading to Lugano where we booked apartment for 3 nights. 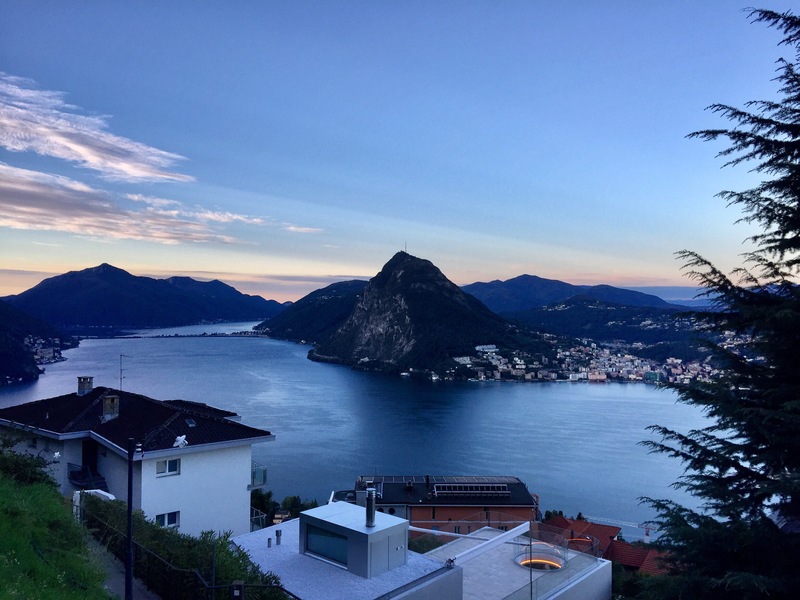 We arrived in Lugano at 4.30 pm and the apartment was stunning location view overlooking Lake Lugano and the downtown. After that it was drinking and enjoying the sunset! 13 Sep 2017: After many days in countryside, mountains, lakes, villages and snow I felt like I needed to visit a big city like Milan. It was not in my original plan but when I realised that it was only an hour by train from Lugano to Milan I decided to take a shopping trip to Milan. I left Lugano at 9.30 and returned at 17:30. It was an enjoyable shopping day in Milan! My husband did not join me in Milan. Instead he took my camera and explored Lugano. After I returned from Milan we went for dinner near our apartment which was recommend by the host but the restaurant was fully booked. 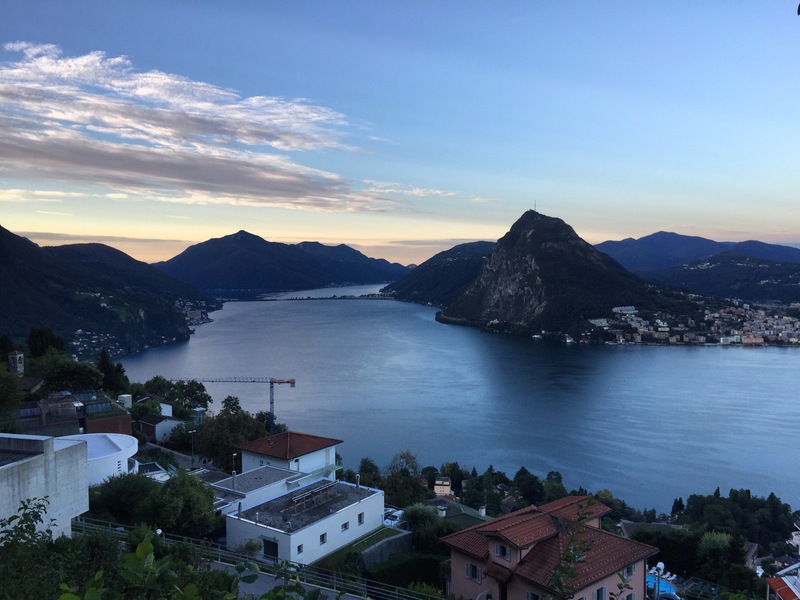 However, the staff at the restaurant recommended another restaurant nearby called “Locanda Gandriese” which was very good, the food was excellent with friendly service and a stunning view overlooking Lake Lugano. Staying here feels like living in Italy! How I ended the holiday! 14 Sep 2017: The weather was not so great today so we decided not to do much, just relax at the apartment, pack to be ready to fly away tomorrow and look at all the photos where we had been in the last 10 days. Traveling in Switzerland gave us a feeling of traveling in 3 countries – France, Germany and Italy. The first place we stayed people speak French and the scenery was vineyards, wineries and the border is next to France. Then we stayed in Interlaken where people speak German and were driving a lot of Mercedes and BMW! And the last place was Lugano where people speak Italian and the border is next to Italy. The architecture of property in each area is different, influenced by the proximity to neighbouring countries and the climate of the area. The 3 apartments we stayed could not have been any better; all of them were specious, fully equipped and located in superb locations with stunning views. We booked them via Airbnb as we prefer to have access to facilities like kitchen, laundry and working space. The 3 places made us feel like home. We ate out from time to time and we also cooked many times when we were sick with local food. I packed some Thai ingredients from home and this helps me a lot when I need spice! Eating out in Switzerland can be pricey, especially in tourist areas. The cost of food in supermarket seems very high compared to other European countries. Switzerland is probably the 2nd most expensive after Norway (from our own experience). Driving in Switzerland was not too difficult. We used GPS sat nav which was very helpful. The roads in Switzerland, especially in the countryside, were quite narrow and we found it a bit scary when other cars approached. The manner of drivers here were very good and we did not see any accident on the road – which is the opposite of Thailand! We both agreed that this was one of the most enjoyable after our road trip in South Africa and camper van trip in New Zealand. 15 Sep 2017: Last few shots of Sunrise before leaving at 7:30 am. I had a chance to do a road trip again when I got a message from my Italian friends that they wanted to visit Thailand (for the first time). After discussing the best way to see Thailand for 8 days, we ended up with this itinerary. As we had very limited time, after picking them up at the airport at 9 pm we went straight away for drinks at one of the best rooftop bars in Bangkok, Moon Bar on the 61st floor above the city with panoramic view at Banyan Tree hotel. This place is my favorite cocktail bar in the city and I think it’s the best way to see Bangkok when you have only 1 night here. My friends had wonderful welcome drinks on their first night in Thailand after a long flight. This stunning place has never disappointed when I brought my foreign friends. My friends also enjoyed staying in Urbana Sathorn hotel, where they have a large swimming pool view overlooking the city of Bangkok. We visited the Grand Palace and Wat Phra Kaew in the morning but we did not visit Wat Pho which is located near the Grand Palace due to limited time we had. I would recommend you to visit The Grand Palace around 2-3 pm followed by Wat Pho. You should then be finished visiting these places by 6 pm in order to catch a beautiful sunset on the rooftop bar at Sala Rattanakosin hotel located opposite Wat Pho. The bar has a stunning view overlooking the Chao Phraya River and Wat Arun. A cocktail with a gorgeous sunset view is a perfect way to celebrate the end of the day. If you finish visiting Wat Pho too early for sunset, you can walk to Pak Khlong Talat, a flower market nearby and come back to the bar near sunset time around 6 pm. If you are hungry I would recommend Apsorn’s Kitchen (ครัวอัปสร), a real deal Thai restaurant located on Dinso Road only 10 minutes by Tuk Tuk from Wat Pho. There are so many things to do and see in Bangkok that you probably need a minimum of 3 days here. We arrived in Pranburi late afternoon and after checking in to the hotel I went straight to the beach. I have been here many times and still enjoy being here as Pranburi is not developed as much as Hua Hin and Cha-Am which are full of hotels and resorts. I always prefer a place that has fewer tourists and authentic local rural life. Pranburi is popular with Thai people as it’s only 2.30 hours drive from Bangkok. You would probably stay here no more than 2 nights so I recommend to stay in a beachfront resort or hotel for maximum enjoyment. We had a great dinner at a seafood restaurant and we ended up on a beach bar where we enjoyed music and watching stars! We left Pranburi around 10 am and instead of taking the highway we took the seaside road through Khao Sam Roi Yot National Park. My friends were impressed with the mountain and agricultural scenery. You will never walk alone! We arrived in Baan Krut beach about mid day. This is the first time for me here and I could not believe how beautiful, peaceful and wonderful this place is. I totally forgot about Pranburi and Baan Krut became my number one favorite place. As I mentioned earlier, I prefer a quiet place with local rural life and if you like the same, this place is the answer for you! We stayed in a beachfront resort called “Baan Montra Beach Resort” where they have an excellent restaurant, swimming pool and great staff. You should also visit “Krom Luang Chumphon Khet Udomsak Royal Palace” located up on the hill only 5 minutes by car from the resort. I very much enjoyed waking up at 6 am to see the sunrise, local rural life and chatting with local people on the beach. This could be my ideal retirement place! To get to Baan Krut beach you can also fly from Bangkok to Chumphon Airport and from there it’s about 100 km by road. There were only my friends on the beach, hardly see any tourists on the beach. This kind man dropped me at the resort after I ran on the beach for a few km and too tired to walk back. We left Baan Krut around 10 am to catch a ferry at Chumphon pier at 1 pm to go to Koh Tao, one of the most popular tourist destinations in Thailand. This was my first visit to Koh Tao. I had heard about it for a long time and I imagined a crazy island with young people having crazy parties on the beach. We stayed in a hotel on Sairee beach which is the center of entertainment. For people looking to have a party and to enjoy drinking, this place is perfect. This area is full of young people, backpackers and the beach is not very clean. If you want to go to Koh Tao and stay in a quiet place, Sairee beach is not for you. The highlight of Koh Tao was renting a boat to explore around the island. There are many good places for snorkeling and scuba driving, e.g. Mango Bay. If you come to Mango Bay I would recommend to eat at the restaurant at Mango Bay Boutique Resort run by Gabriele Pilotto, an Italian guy who happens to be chef as well. I have been living in Phuket for 8 years since 2008 so before you ask me for any recommendations, you have to tell me first what you are looking for and what is your budget. In Phuket you can get anything from a cheap room to a luxury villa and from street food to a fine dining. If you enjoy partying, drinking and want to stay in a budget hotel, Kata, Karon and Patong can offer you that. But if you are looking for a relaxing place, nice restaurant, quiet beach I would recommend to stay in the north of Phuket, e.g. Layan, Bang Tao, Surin and Kamala. My friends were not completely happy with their choice of hotel in Kata and they did not like the environment of the entertainment area. You can rent an IDEAL Property if you want something more like home instead of a hotel. My friends enjoyed beaches so much that they ended up staying on Bang Tao and Layan beach for 2 days! Other than that, they also visited the Big Buddha and tried riding elephants. We had great dinning at Mom Tri Kitchen in Kata and the last evening at Baan Suan Layan. My friends also enjoyed a Thai country style pub full of only Thai people, Ploen@Chalong located in Chalong, where there was a live band playing. Try this place as an alternative to the tourist bars for a fun night out. There are a lot of places to visit in Phuket; I wish my friends had more time so I could show them my other favorite part of Phuket, Phuket Old Town. Our friends enjoying the beach! Say good bye to a wonderful day! We drove about 914 km from Bangkok to Phuket. The longest time on the road was 5 hours from Ao Thung Makham Pier in Chumphon to Phuket when we returned from Koh Tao. If you don’t want to drive too long you can stay in Kao Sok National Park in Surat Thani for a night and visit Ratchaprapha Dam before heading to Phuket. On the way to Phuket if you have time you should stop at Ao Phang Nga Marine National Park , rent a boat and explore the park before arriving in Phuket.